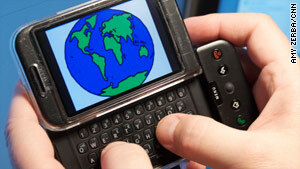 There are lots of smartphone apps that vow to help you be more Earth-friendly. Here's a look at three. (CNN) -- The word "green" has become a vague and overused marketing term for something that's supposed to be good for the environment. But "going green," or at least trying to be more conscious of one's impact on the Earth's natural resources, is still a personal goal for many. In that spirit, and in light of the United Nations Climate Change Conference going on this week in Copenhagen, Denmark, here's a look at three smartphone apps that claim to help you be more gentle to Mother Earth. GetGreen (iPhone, $0.99) -- A project of the Environmental Defense Fund, this app offers a daily "green" tip in an effort to "provide you with daily ammunition in our common battle against climate change." Skeptics will ask, "What common battle?" but others may appreciate the advice, which is easy to follow. Sample tips include adding used coffee grounds to your garden as fertilizer and not rinsing dishes before you load them in the dishwasher, which GetGreen says can save an average of 6,500 gallons of water a year. Pros: If there's a tip that seems especially clever or helpful, a button will allow you to e-mail it to a friend. Cons: There's no way to scroll back through previous tips, and some users have complained that the same tips show up over and over. A Real Tree (iPhone, $0.99) -- Buy an app, plant a tree. That's the basic idea behind this venture, which promises to plant a real tree -- thus the name -- in one of 12 countries fighting deforestation. The organization, a partner with the United Nations Environment Programme (UNEP), says it has planted almost 1,500 trees in Honduras, India, Ethiopia and nine other countries. Pros: It's a good cause, and a buck for a live tree seems like a pretty good deal. Cons: The app's interface is disappointingly simple: After a brief animated intro of a tree sprouting in a meadow, it just directs you to A Real Tree's Web site. Find Green (iPhone, free) -- Looking for environmentally friendly businesses in your area? This app mines the database of GenGreenLife.com, which says it is the largest green directory in North America, then uses your phone's GPS feature to list environmentally conscious merchants near you. My initial search for "food and dining" options within biking distance of my location in downtown Atlanta, Georgia, pulled up 24 restaurants, grocery stores and farmers' markets, along with their locations in Google Maps. Pros: The app also contains a news feed with "green"-centric articles from the Mother Nature Network, including coverage of the Copenhagen climate summit. Cons: To be listed in the GenGreen directory, merchants must "demonstrate consistent efforts to reduce, reuse and recycle resources and reduce negative impacts on the environment," among other criteria, but it's not clear how their practices are evaluated. After all, "green" is a relative term. Apps of the Week: To infinity, and beyond!